The Center has created the map below identifying some locations of prominent EB-5 scandals. In the balance of the program, the segment not subject to the September sunset (which is rarely used), an alien may make a million dollar investment directly, and not use regional centers. The part of the EB-5 program under discussion on the Hill allows an alien investor with no other qualifications to secure a set of green cards for the investor, the investor’s spouse, and all their under 21-years-of-age children if $500,000 is invested in a Department of Homeland Security-approved, non-guaranteed investment. These investments are handled (and sometimes mishandled) by a set of DHS-licensed regional centers. EB-5 investments are usually in glitzy, downtown locations like Manhattan, Miami, Las Vegas and Los Angeles, as reflected on the map. The original intent, to locate these investments in areas of high unemployment, has been thwarted by clever developers and passive government agencies. The notations on the map show some of the locations where EB-5 actors encountered legal issues or have incurred other types of formal, public troubles – ranging from a mysterious death in South Dakota to numerous federal and state indictments, to governmental and investors' civil suits. The reader can click on the indicator on the map to read about the matter in question. 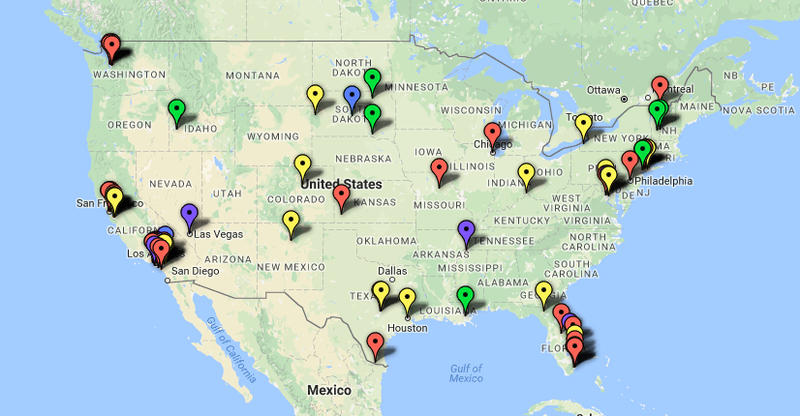 The map shows formal published actions taken against EB-5 actors in recent years and known to CIS. The actions noted include criminal indictments or pleas, civil suits filed by government or private interests, reports of Inspectors General, and a few corrective actions taken by the Department of Homeland Security. Terminations of regional center status by DHS are only included when fraud was alleged. The Center will correct and update the map as new information is acquired. If you have insight to EB-5 visa fraud, please let us know: help@cis.org (please add “EB-5” to the subject heading).